2017 Panini National Treasures XANDER BOGAERTS Base Jersey #/99!!! XANDER BOGAERTS 2014 TOPPS WALMART BLUE RETAIL EXCLUSIVE SP ROOKIE RC! RED SOX! 2017 Topps Inception Purple XANDER BOGAERTS #’d 043/150! SEE MY OTHER CARDS! 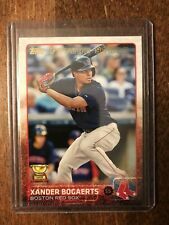 2017 Topps Museum Blue XANDER BOGAERTS #’d 004/150! SEE MY OTHER CARDS! XANDER BOGAERTS 2018 IMMACULATE EYE BLACK JERSEY AUTO 11/15 RED SOX GOLD AUTO! This page was last updated: 19-Apr 16:35. Number of bids and bid amounts may be slightly out of date. See each listing for international shipping options and costs.